At two of the top-10 largest shopping malls and the largest outlet mall in the United States, Gable’s customized visual solutions are front and center. Gable encompasses a unique blend of technology, digital components, and digital marketing artistry. Across America, Gable is helping high-traffic properties create immersive digital experiences that create revenue and reach the heart and soul of consumers. Among those who have trusted Gable this year are three shopping centers that together, gross nearly $5 billion per year: Aventura Mall in Aventura, Fla., Roosevelt Field in Garden City, New York, and Woodbury Common Premium Outlets in Central Valley, New York. At 2.7 million square feet, Aventura Mall is the largest conventional shopping mall in Florida and the third largest shopping center in the United States. The mall tapped Gable to install an array of high-resolution digital displays, creating a new LED digital environment with a dynamic system of full-color, 6mm high resolution signage. Gable’s design team customized each display to maximize the visitor experience. Ranging from 150 to 500 square feet, the displays are designed to fit every element of the mall — with some curved and others shaped specifically for their architectural environments. Providing stunning clarity, the displays automatically adjust brightness as natural light comes and goes through the mall’s skylights. Gable recently installed a display in the center court at Roosevelt Field that provides a higher resolution than any screen used in the same manner, anywhere in the world. 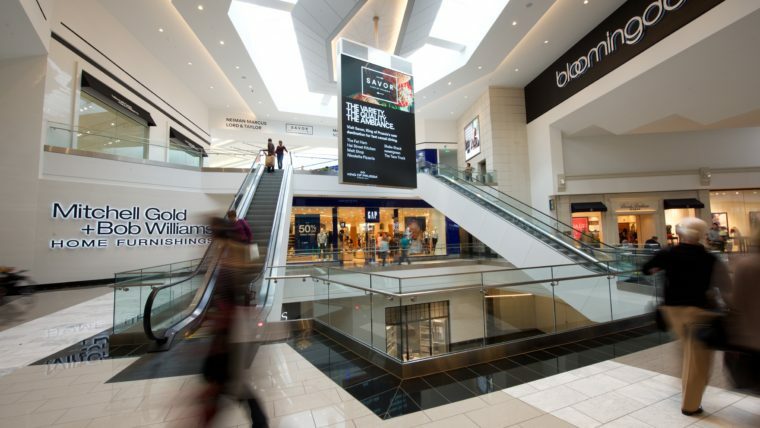 Roosevelt Field, the second-largest full price shopping mall in the state of New York and ninth largest in America with 2.2 million leasable square feet, sought out Gable to install a unique display in the mall’s center court. Gable answered the call with a one-of-a-kind, double-sided, 3875mm x 5500mm display that hangs from the roof of the mall’s center court. Gable also provided Roosevelt Field with internal speakers and a sophisticated AV system that can be monitored and controlled anywhere in the world using a mobile device. Grossing nearly $1.5 billion per year, Woodbury Common Premium Outlets is the highest grossing outlet mall in the world. Following Gable’s successful installation of its one-of-a-kind screen at Roosevelt Field, Simon Property Group – which operates both Woodbury Common and Roosevelt Field – asked Gable to install a similar display at the outlet mall in Central Valley, New York. Gable provided a customized solution to fit the design of Woodbury Common’s center court, suspending the display from a single pole off the roof. The 2875mm x 4810mm version of Roosevelt Field’s display also comes with internal speakers and an AV system that allows for full control. With new digital environments, Aventura Mall, Roosevelt Field and Woodbury Common are providing visitors every day with a top-of-the-line digital experience that is aesthetically and financially beneficial. 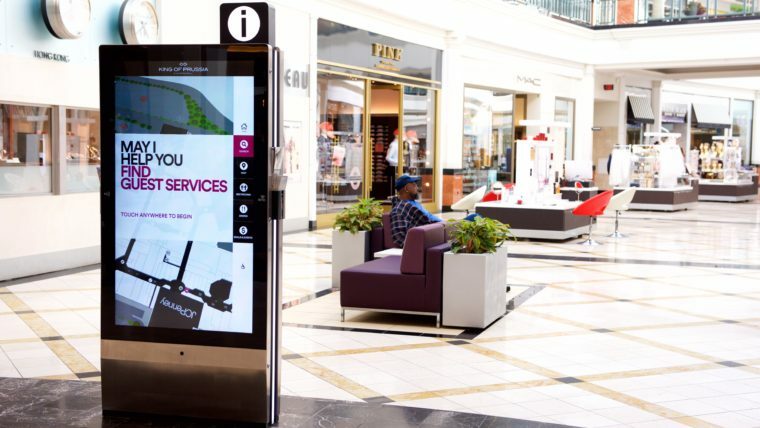 In an increasingly competitive marketplace, the displays provide each shopping center vehicles to display advertising and art in high-traffic areas. The shopping centers can sell ads that reach thousands of eyes each day and connect with their communities like never have before. With Gable’s digital media team at their service, the work does not end when the displays are installed. As new, creative ways to utilize the displays are thought of every day, Gable provides the resources needed for effective content creation that reaches the heart and soul of consumers.